In a food processor, combine the flours, salt and sugar. Pulse 5 times to combine. Add the shortening and process until the mixture resembles wet sand. Scatter the butter into the food processor and run again for about 10 seconds or until the butter is in tiny pieces, none larger than a small pea. Sprinkle about 4 tablespoons of the ice water into the food processor and pulse until the dough barely begins to come together. Add more water if needed. Turn the dough onto a clean work surface and quickly press into two equal pieces. Shape into disks, wrap in plastic, and refrigerate for 1 hour. While the dough chills, combine the apples with the cinnamon, nutmeg, salt and orange juice. Set aside. Preheat the oven to 425 degrees Fahrenheit and line a large, rimmed baking sheet with parchment. Set aside. Lightly flour a clean work surface and, working with one round of dough at a time, roll the chilled dough into a 14×7 inch rectangle. The dough should be about 1/8 inch thick. Cut the rolled out dough into 4 smaller rectangles. 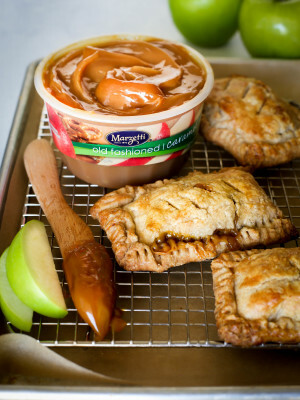 Scoop a modest spoonful of the apples into one half of each rectangle, then top the apples with a tablespoon of caramel. 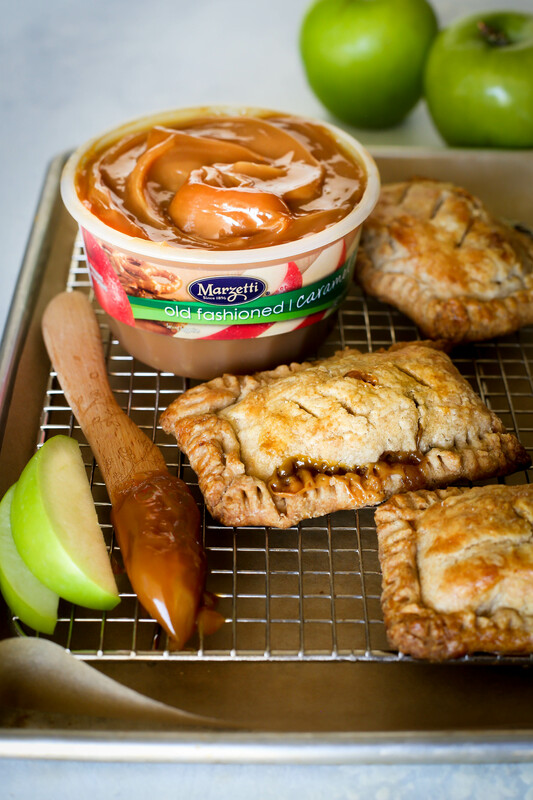 Fold the dough over the apple filling and press the edges to seal. Cut 3 small slits into the top of each pie. Repeat this process with the remaining dough and filling. When all of the hand pies are filled, transfer them to your baking sheet and brush them lightly with the egg white. Bake for 25 minutes or until the crust is golden brown and the caramel begins to bubble out of the slits in the top of the pies.